The main problem, or challenge, facing the Potter film franchise isn't the changing of director Chris Columbus mid-stream (he helmed the first two). Nor is it the maturing of its three main stars (Harry, Ron and Hermione) from innocent children touched with baby fat to gangly, developing teenagers (although that is an issue that will continue to grow as its stars do). The main obstacle facing the Potter film franchise is that what it is attempting to do has never been tried in cinematic history: adapt a number of books in order in an ongoing story arc while that arc is still unresolved and being written. And that challenge brings its own obstacles to overcome. 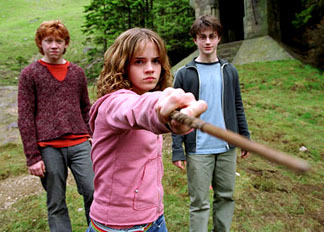 While the first two instalments established the world, the antagonists and the protagonists, Harry Potter and The Prisoner of Azkaban feels more like mid-season episodic television, where while new characters are introduced, and pre-existing ones developed, the main plot (in this case, Potter's ongoing battle with, and revelations regarding, Lord Voldemort, the wizard who killed his parents) isn't furthered. However, it's still a strong instalment. Once again, Potter returns to Hogwarts School of Witchcraft and Wizardy, this time for year three, and because he's Harry Potter, has to face some unspeakable evil on top of everything else an abnormal boy enrolled in a wizard school has to face. In this case, Sirius Black, an escaped lunatic somehow connected with Harry and the death of his family, and the unleashing of the Dementors, Death-like guards from Azkaban prison sent to recapture Black, who also take an unhealthy interest in Harry. New director Alfonso Cuarón (Great Expectations, Y Tu Mamá También) takes the keys to the chocolate factory from Columbus and while he retains much of the magic and look of the Potter-verse, he gives number three a more realistic coating (everything looks less fantastical and the Potter triumvirate spend more time in pants than robes) and stamps it with a darker tone (thanks mainly to the Dementors and a more stark gothic aesthetic). Of course, losing Richard Harris (the original Dumbledore) was a terrible blow, but Michael Gambon gives the headmaster a new spin, while Gary Oldman (as Sirius Black) is awesome in lunatic mode (however fleeting) and the usual stellar talent (Rickman, Smith, Coltrane) still shines. However, David Thewlis (as Professor Lupine) excels in a surrogate father role to Harry, while Daniel Radcliff (Harry), Emma Watson (Hermonie) and Rupert Grint (Ron) only get better with each movie.